Silver Strand, Galway Bay, Ireland; lower-shore rock. 05 Apr 2012. Michael Guiry. © Michael Guiry (mike.guiry@nuigalway.ie). Cystoclonium purprueum Cuan, Ventry Harbour, Co. Kerry, Ireland. 11 Aug 2010. M.D. Guiry. © Michael Guiry (mike.guiry@nuigalway.ie). New Quay, Co. Clare, Ireland; on lower-shore ledges; to 80 mm. 14 Apr 2006. Michael Guiry. © Michael Guiry (mike.guiry@nuigalway.ie). Trá an Dóilín, An Cheathrú Rua, Co. na Gaillimhe; lower intertidal rock. 05 May 2008. Michael Guiry. © Michael Guiry (mike.guiry@nuigalway.ie). Spiddal, Co. Galway, Ireland; MLWN plants in sand. 22 Mar 2002. Michael Guiry. © Michael Guiry (mike.guiry@nuigalway.ie). Finavarra, Co. Clare, Ireland; plant to about 90 mm long. 08 Aug 2004. Michael Guiry. © Michael Guiry (mike.guiry@nuigalway.ie). Finavarra, Co. Clare, Ireland; plants with cystocarps. 08 Aug 2004. Michael Guiry. © Michael Guiry (mike.guiry@nuigalway.ie). Spanish Point, Co. Clare, Ireland; lower intertidal pools; with cystocarps. 04 Aug 2004. Michael Guiry. © Michael Guiry (mike.guiry@nuigalway.ie). 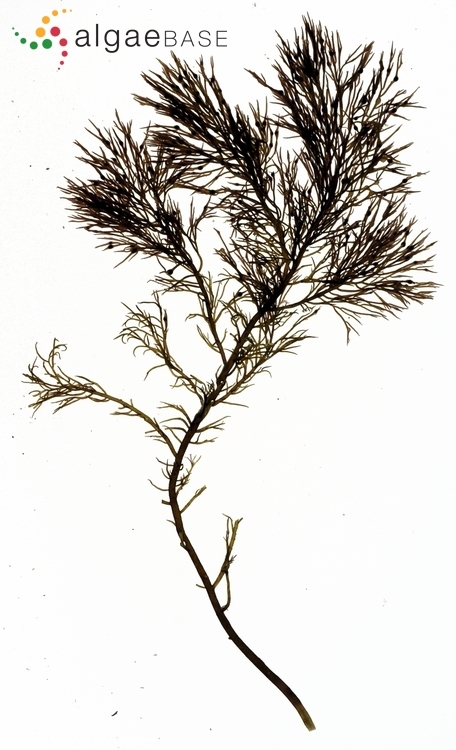 The type species (holotype) of the genus Cystoclonium is Cystoclonium purpurascens (Hudson) Kützing. Type locality: "Habitat in saxis et rupibus marinis" [England] (Hudson 1762: 471). English: Purple Claw Weed (Bunker et al. 2010). 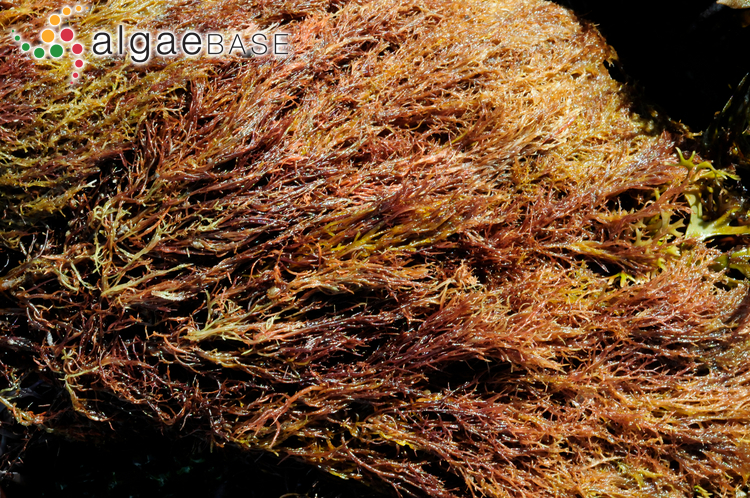 Rather soft, cylindrical, dull purplish pink fronds, 3 mm wide, to 600 mm long. Branches numerous, alternate, branchlets tapered at both ends. Branches sometimes drawn out into long twisting tendrils. Multiaxial, medulla a cordlike strand of loosely interwoven, narrow filaments, surrounded by large, rounded cells, with outer layer of small, angular, assimilatory cells. Said to have an onion-like smell shortly after collection. 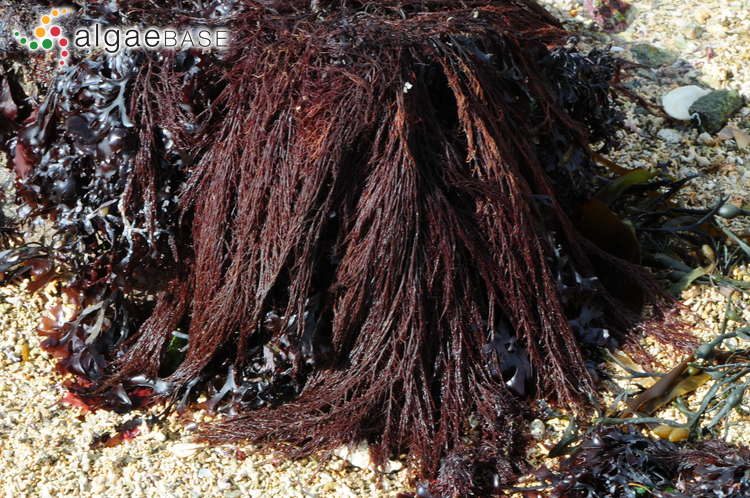 On rocks and stones intertidally and in shallow subtidal, generally distributed, abundant. Accesses: This record has been accessed by users 9736 times since it was created. Edelstein, T., Bird, C. & McLachlan, J. (1974). 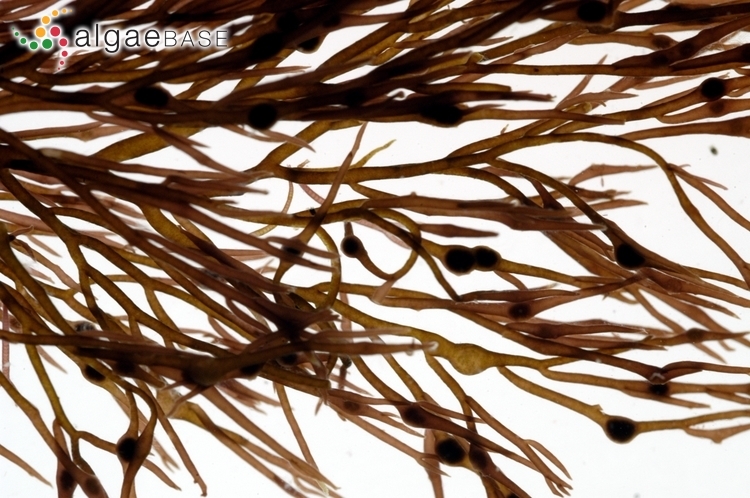 Tetrasporangia and gametangia on the same thallus in the red algae Cystoclonium purpureum (Huds.) Batt. and Chondria baileyana (Mont.) Harv.. British Phycological Journal 9: 247-250. Molenaar, F.J., Breeman, A.M. & Venekamp, L.A.H. (1996). 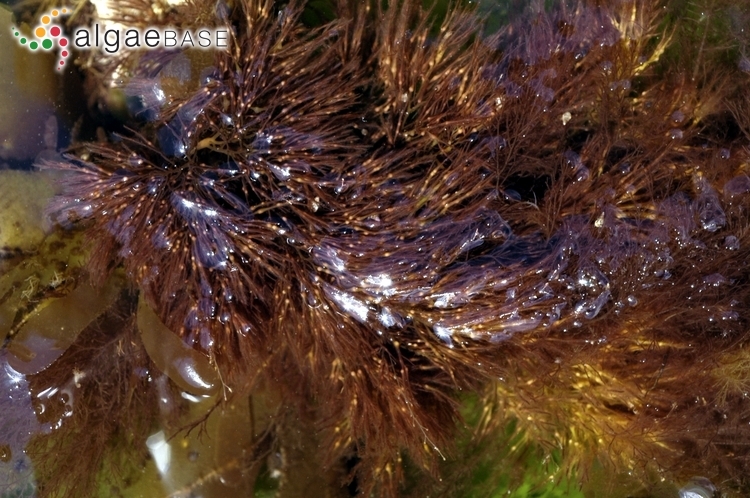 Ecotypic variation in Cystoclonium purpureum (Rhodophyta) synchronizes life history events in different regions. Journal of Phycology 32: 516-525, 4 figs, 6 tables. Reani, A., Cosson, J., Parker, A. & Zaoui, D. (1998). 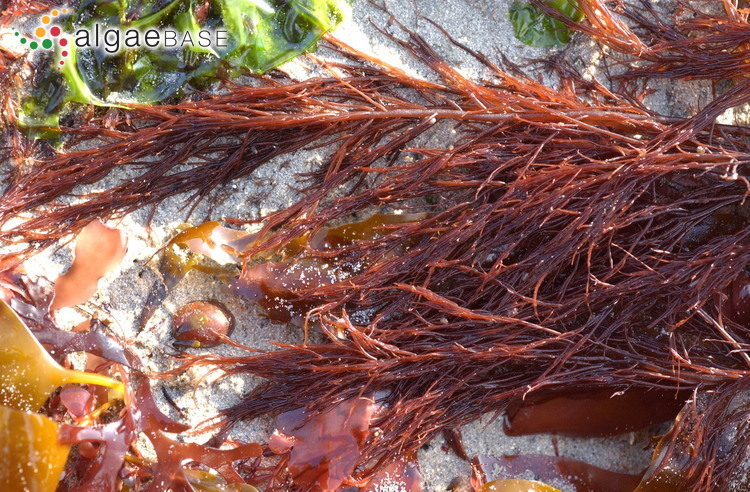 Influence of culture conditions on growth and rheological properties of carrageenans in Cystoclonium purpureum (Huds.) Batters. Botanica Marina 41: 299-304, 8 figs, 1 table. Reani, A., Cosson, J., Parker, A. & Zaoui, D. (1998). 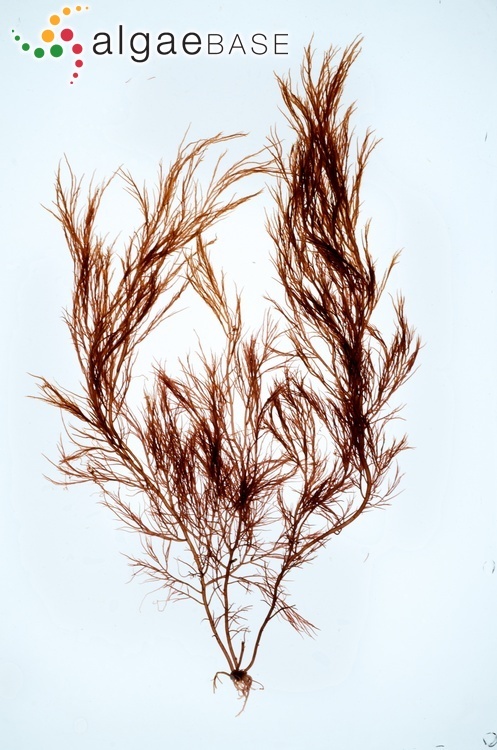 Seasonal variation of growth carrageenan content and rheological properties of Cystoclonium purpureum (Huds.) 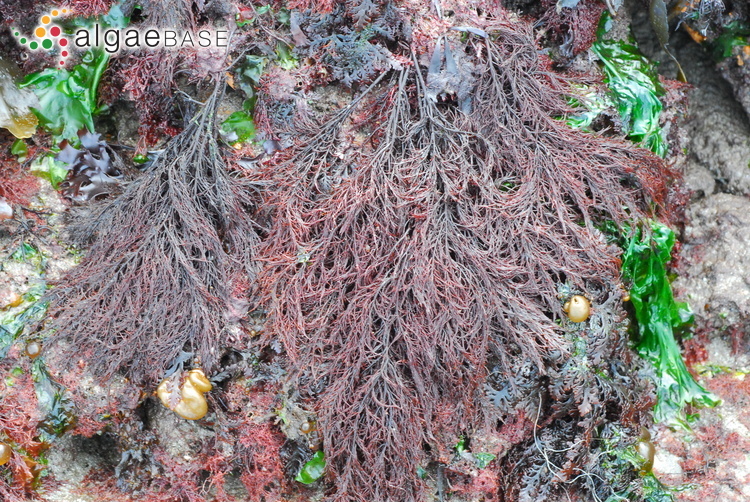 Batters (Rhodophyta, Cystocloniaceae) from the Calvados Coast (France). Botanica Marina 41: 383-387. Thrainsson, S.A. & Hommersand, M.H. (2012). 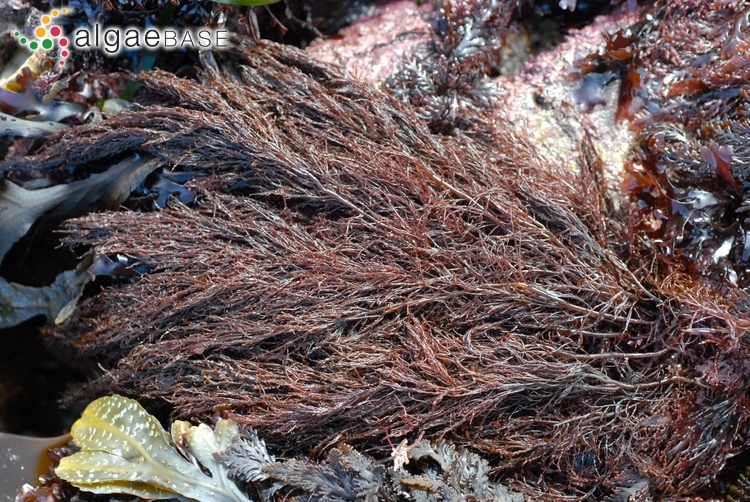 New features in the vegetative and reproductive morphology of Cystoclonium purpureum (Cystocloniaceae, Rhodophyta) from the North Atlantic Ocean. European Journal of Phycology 47(4): 384-392.